A 2015 study by Microsoft concluded that those of us living in the Digital Age have a shorter attention span than that of a goldfish. Flattering, no? While this conclusion was questioned (and ultimately debunked) when evaluated at a deeper level, we do nevertheless learn that our desire for quick, efficient communication is no doubt on the rise. Even if the goal is to provide in-depth content and thought leadership, presenting that information in a way that is more attuned to our proclivity toward brevity (or at least getting to the point in short order) will no doubt yield far better engagement. 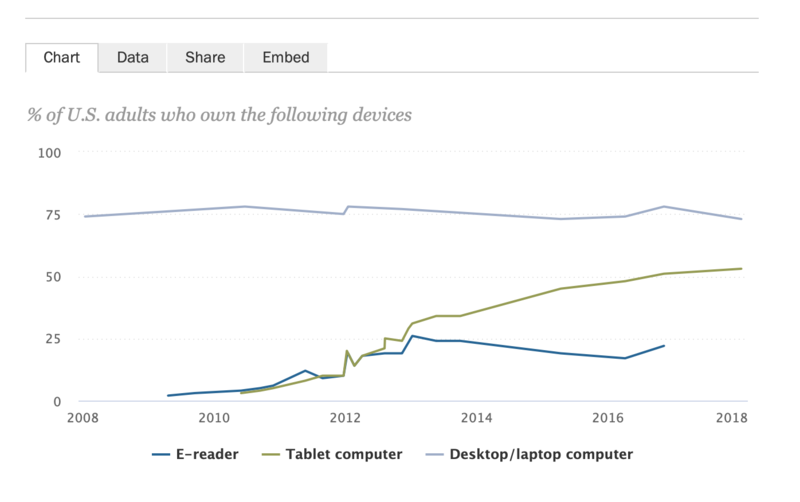 Since 2011, the growth in usage of smartphones — phones that function as portable computers — has doubled, according to Pew Research Center. And while the Boomer Generation is less apt to rely heavily on their smartphones for everything from news and information to entertainment and communication, all subsequent generations are embracing this technology with gusto. In fact, most Millenials would be hard pressed to imagine life without their mobile device(s). But this isn’t a matter of generational preferences. 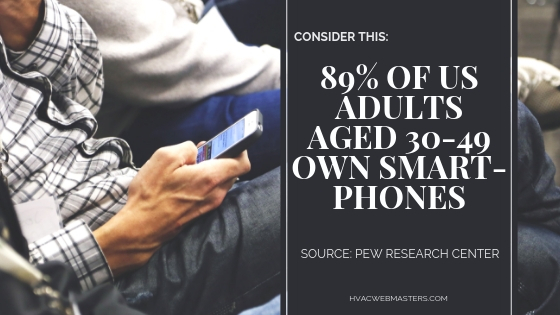 Even if you consider the median age group, those who are perhaps most likely to be shopping for the heating and cooling services your company provides, 89% of them own smartphones. That is significant because it gives you a critical clue in terms of how your target customers are going to be reached: on their mobile device. For the sake of your business, your HVAC website must be just as user-friendly on an iPhone as it is on a MacBook. Smartphones may be ubiquitous at this point in time, but also growing is the prevalence of mobile device use in general, such as tablets. And this is where we have to acknowledge the importance of Responsive Design, which in a method of website development that considers how a site or page will look when viewed on any device or screen size. When thinking about how your HVAC company’s website looks on-the-go, it’s worthwhile to consider the design in general for viewing on multiple devices, not just a phone. Does it operate as smoothly on a smartphone as it does on an iPad? What about the desktop user, since many of your potential commercial HVAC clients are spending the majority of their days at one of those? By showing up well online for all possible entry points for HVAC leads, you’re far more likely to profit from the time and expense invested in these efforts. So with this in mind, let’s discuss how you can show up well with your HVAC internet marketing strategy for mobile. Remember the point I lead with about the goldfish? It turns out we’re a little more complex than our fishy friends. (Phew!) But the point is still worthy of consideration. With the rapid speed of technology and the incredible pace of information presented to us with every passing second, we’ve adapted…for better or worse. We want what we want now. Even while employing critical thinking skills, we move through steps of discernment very quickly these days. This is vital to grasp when you think about your potential customers, dealing with an unexpected air conditioning failure or a heating system gone haywire. They need a professional (you!) fast, and the path between crisis and resolution is shortened the moment they get a call in for help. So your job — beyond making a swift and sturdy repair — is to make sure they can find your company with ease. And this means invoking whatever tools or strategies are necessary to make their search simple and effective. Not only does the poor user experience result in a higher bounce rate, which means far less likelihood that the viewer will engage, but it also hurts your search rankings. That’s right: This is so important, that you will suffer in the Google search rankings if your page doesn’t load promptly. And it’s not just desktop-oriented sites that suffer. That valuable mobile site that we talked about as part of your must-have internet marketing strategy for your HVAC company? Yup, it’s being evaluated as well. If it takes forever to load your website on a smartphone, you’re going to feel the pain just as much as your customers. What Causes Slow Mobile Site Loading? There are many elements of mobile design for HVAC websites that can contribute to the load speed (or slack). But some of the simplest offenders are easy to avoid if you are focused on a sleek, simple mobile user experience for potential clients. Bells and whistles just aren’t as appealing these days when it comes to web design, where form and function are really the name of the game. You may not be coding your mobile site, but it’s vital that the people you’re entrusting to do so are developing a back end that is clean and intentional. Google pays attention to this and will demote sites that are messy behind the scenes, too. There are some awesome plugins — or developer tools — which allow your website to really functional well. But there are many, many plugins out there that don’t function well or add actual value from a user’s (that’s your potential customer’s) experience. If there’s a widget on your website, make sure it works well from a desktop, a smartphone, and a tablet. It’s not worth the load time lag if you can’t justify its existence on your page. Our attention span may be waning a bit, but that doesn’t mean that every flashy object gets our attention. Utilizing Adobe Flash can be a great means of differentiating your site and presenting a cool, animated visual, but it can also be gimmicky when done poorly. Flash doesn’t translate for mobile devices, so a distinct mobile design is necessary if you’re employing Flash elsewhere. Nothing is more frustrating than deciding to click through the Google search results to a site, with the intention to engage for service, only to have a heck of a time finding a means of connecting. A prominent call button is a no-brainer. Especially when considering mobile design for HVAC services, it needs to take seconds for a visitor to your site to locate your phone number. They’re not perusing heating and cooling specialists for sport; they need something, and they likely need it now. You want your phone to ring. Constantly. We get that. A mobile site that doesn’t make your contact information prominent — including phone number, email address, physical address, and social media links — is not serving the most basic function. Take a moment real quick and Google HVAC companies in your service area. Maybe you’re not on Page 1 (yet! ), but take a look at those who are. Are you having to search for their information? My guess is you don’t even have to click through to their site to reach them; their number is probably right in the meta description (that text underneath the site name that displays in the search results). This is exactly what your potential customers are used to, so even if you did get a click-through to your mobile site from a Google search on-the-go, that action button had better show up before almost anything else! Mobile Design Readability: How Far Away Do I Have to Hold This Thing? I’ll be honest: I’m no spring chicken. I appreciate the larger screen size of modern smartphones. And since I, like many users, are more apt to use my phone as a mini computer versus a telephone, I spend a lot of time gazing at my iPhone screen. Because of the proliferation of smartphones and how they’re used (exactly as I just mentioned), it’s vital that mobile design take into consideration the presentation of your HVAC website on a smaller screen (compared to a laptop, for example). Yes, the font size should be legible, but you also don’t want to overcompensate and take up the entire screen with three sentences. I’m not sticking around for that page. Bounce! As important as the font size is the font itself. Don’t go overboard with options for your text, as both the variety and style of fonts can be a load lag and visual beatdown. Opt for simple and sleek. In fact, consider that your mantra when it comes to mobile design. Sans serif fonts are pleasing to look at, and are used often enough to provide a familiar user experience. Consider color, too. Remember that 8% of men are color-blind or have a red-green deficiency. Also, people keep the brightness level of their phones at different levels, not to mention utilizing features like Night Shift to reduce eye strain. Mobile websites that represent text without significant contrast may lose viewers, in that the user literally can’t make out words from the background, such as the case of a white font against a pale gray background. It may look cool, but it’s not serving its purpose. The information is literally lost on the viewer. The reason you are spending any time learning about mobile design for your HVAC website is not because you desire to become a webmaster. (I’m making an assumption here, but I think it’s a good one.) You are a heating and air specialists. That’s what you do best! But you want to keep your business relevant and booming. Cheers to you for getting after it! When it comes to your approach to internet marketing for HVAC services, remember that goal: to get and keep more customers. If your mobile website isn’t functioning quickly and providing a great user experience to all those folks finding your company from the awesome SEO work you’re doing, then it simply isn’t functioning.